The biggest news in the airline sector of late is probably the announcement by Delta Air Lines, Inc. (NYSE:DAL) to buy a Phillips 66 refinery in Trainer, PA. Delta will pay $150 million for the 180,000 barrels per day (bpd) facility, spend an additional $100 million to upgrade the plant, and get $30 million in state subsidies for infrastructure and to create jobs. Under the proposal, JPMorgan Chase & Co.(NYSE:JPM) is reportedly part of the package as well. Delta would purchase the refinery and JP Morgan’s commodities team would finance the refining process, including buying and shipping crude oil from overseas. Delta would then buy the jet fuel from JPMorgan Chase & Co. (NYSE:JPM) at a wholesale rate, and the bank would sell the other products made by the refinery into the market. The reason behind this unprecedented move is to use the refinery as the ultimate fuel hedge by saving Delta about $300 million a year in jet fuel costs. In our view, despite the optimistic savings projection, there are pros and cons of this deal for Delta. (2) With JP Morgan bankrolling the whole thing, Delta could benefit from JPM’s expertise in the energy trading market, as well as financing, thus reducing the risk of taking on the refinery operation alone. (3) Regardless of the outcome, Delta management at least took a bold and novel approach using physical asset to hedge fuel, instead of the industry standard paper-based hedging program pioneered by Southwest Airlines. 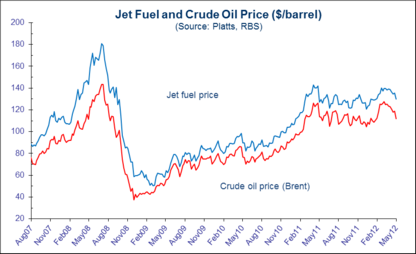 (1) The biggest cost component of jet fuel is crude oil, which means any savings Delta seeks is driven by the crack spread–the difference between the price of a barrel of oil, and sale price of refined product. Trainer plant is one of the older refineries that relies on the most expensive grades of crude oil as feedstock. Even with JPM’s backing, what are the odds of an airline and a banker succeeding where Phillips 66 failed? (2) Refining is not Delta’s core expertise. Refinery operation is quite complex, which both Delta and JPM have little experience. Integrating a refinery into Delta’s business will be a major challenge distracting Delta’s focus. Assuming Delta and JPM can immediately put together an appropriate management team, smooth running will still take at least 2 to 3 years. (3) We also question if the projected $300 million a year savings includes the cost of running the refinery? Theoretically, if Delta is getting cheaper fuel price from Trainer, that would suggest the refinery most likely is not making money from the transaction. (4) Furthermore, the jet fuel market on the East Coast has tightened up quite a bit due to the closure the Trainer Plant which accounts for one third of the jet-kerosene capacity in the region. So, re-opening the now idled Trainer refinery could actually increase the jet fuel supply benefiting even Delta’s competitors. (5) Delta seems to have entered this deal out of desperation during the oil price spike from Iran nuclear controversy. If oil price stabilizes or weakens as some of the forecasts seems to suggest, this could well end up being a wasted investment. With almost every US-based airline in bankruptcy at one time or another, the airline industry in general has not had a very good track record of competent management. On that note, we have to wonder if the money and resource invested in this deal could be better utilized in areas such as customer service and flight safety. After all, price and quality is what matters the most in any business, including airlines.